“Comedian” Jimmy Kimmel turned his late night show into a lecture on the failed and bankrupt Obamacare this week. He considers himself an expert because his son had heart surgery. Of course, he has no idea that the premiums are unaffordable for a majority of American families. But, he’s an elitist so he’s going to lecture anyway. On Wednesday night he followed his lecture on Obamacare with threats to beat FOX host Brian Kilmeade. This was in his opening monologue. On the Wednesday broadcast of his late-night program, Jimmy Kimmel responded to criticism he has received for his controversial monologue Tuesday night where he ripped Republican Senator Bill Cassidy for using his name to push for the Cassidy-Graham Obamacare replacement proposal. 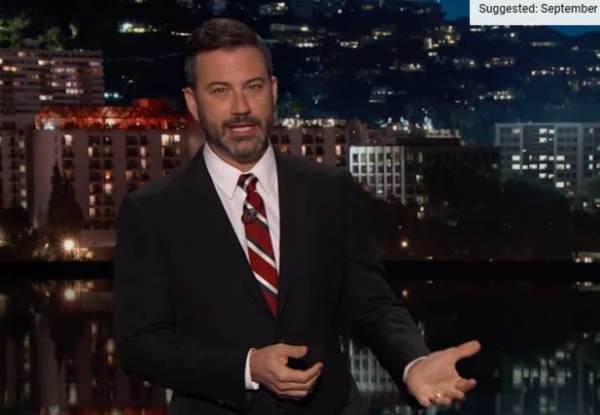 Kimmel, a fierce proponent of the healthcare law, received many rebuttals for his political statement notably FOX & Friends host Brian Kilmeade. Kilmeade called Kimmel a member of the “Hollywood elite” for “pushing” politics. Wednesday night on Jimmy Kimmel Live, the host set his aim at the FOX host and let loose. …”I don’t get anything out of this, Brian, you phony little creep. Oh, I’ll pound you when I see you,” Kimmel threatened. Of course, the far left crowd loved it.